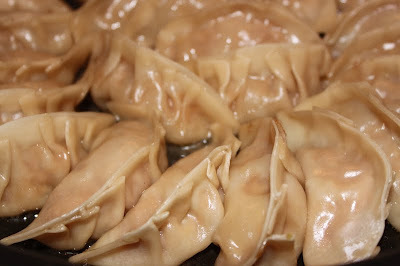 Potstickers, sometimes called gyoza, are a staple food in my house. 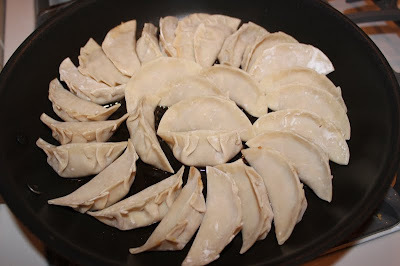 It's nice to come home from a busy day and toss some frozen potstickers in the pan, start some rice, and make a real easy small meal. My son sometimes says words incorrectly, which is normal for kids. 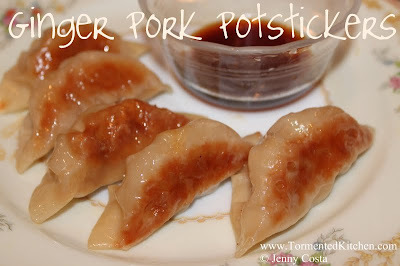 He wouldn't eat these if I called them potstickers. 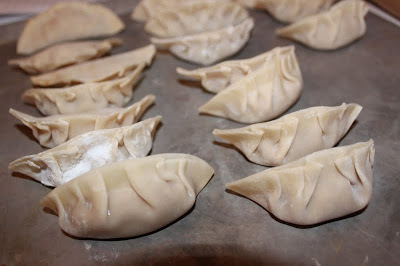 By calling them dumplings, they are suddenly delicious and he will ask for Chinese Ducklings. Yes, he means dumplings but it comes out as ducklings. I think that's pretty cute. 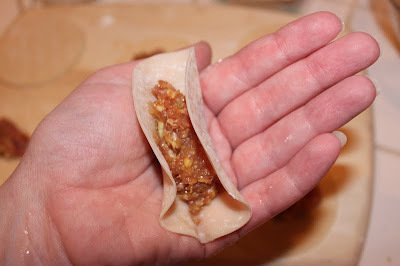 This is enough for 50-60 potstickers, depending on the size of your wrappers. Mine were on the small side compared to those I get in restaurants. I froze about half the batch for later. 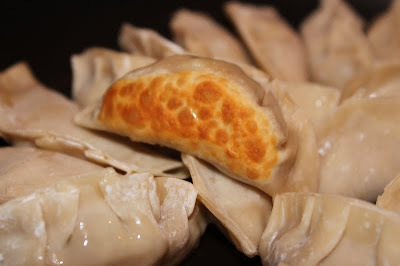 Just a note on the potsticker versus gyoza name, it has to do with the seasonings. This recipe is slightly more Chinese since I used Shaoxing rice wine. Japanese gyoza may contain miso paste, green onions, and sake. I think that is the difference. At least for me, it is. I think for either one, it's normal to add carrot or shrimp, if you like. 1. Shred the cabbage. 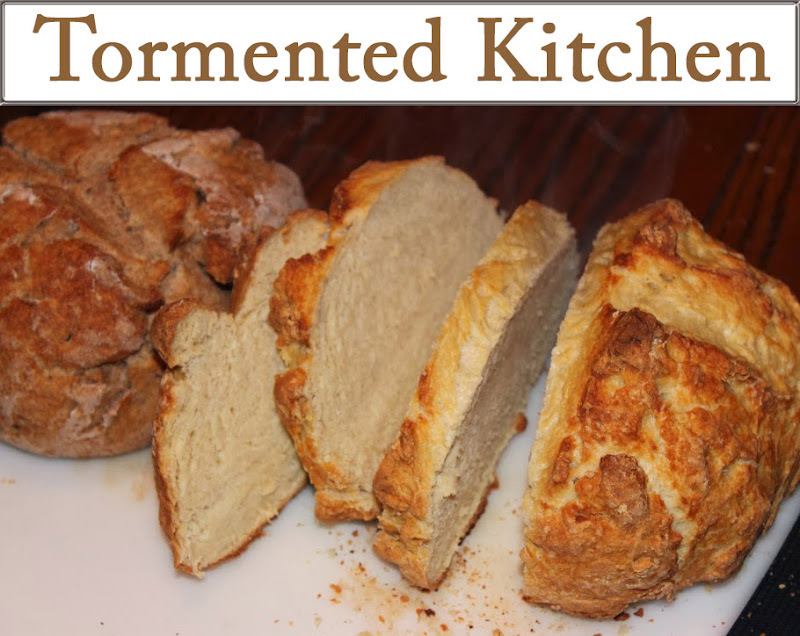 I used a food processor to get tiny pieces. The kids are very picky about green foods right now, so the smaller the better for them. My extra tiny cabbage yielded about 2 cups of shred. 2. Sprinkle the salt over the cabbage and let stand about 15 minutes. 3. Rinse cabbage with some fresh water and squeeze out as much moisture as possible. I put it it a sieve and squeezed out the water using a rubber spatula. You want it dry so your filling isn't too wet. At this point, I had a little more than 1 cup of squeezed cabbage shred. 4. Combine the squeeze-drained cabbage, pork, ginger, garlic, soy sauce, sesame oil, and shaoxing rice wine in a bowl. 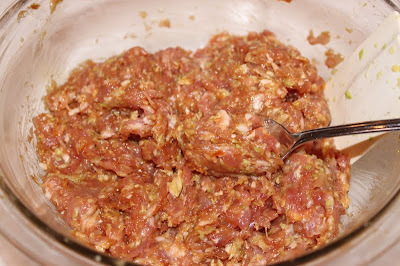 I used my hands to mix it well like meatloaf. 5. Combine the water and cornstarch. Mix well and set aside for now. This will be your wrapper sealant. 6. 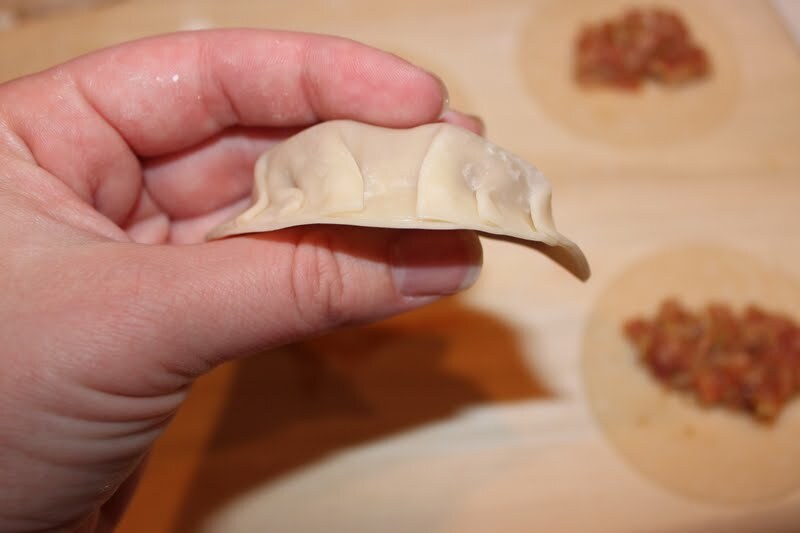 Lay out your potsticker wrappers on a cutting board. 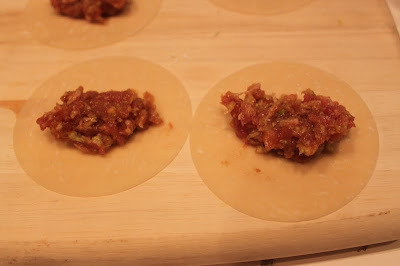 Fill each wrapper with about a teaspoon of pork mixture. If it's too full, it won't seal nicely. 7. Holding the wrapper with filling in your hand, sort of fold it up like a taco. Use a little cornstarch mixture to wet the edges with your fingertip. Now press the top center together. 8. 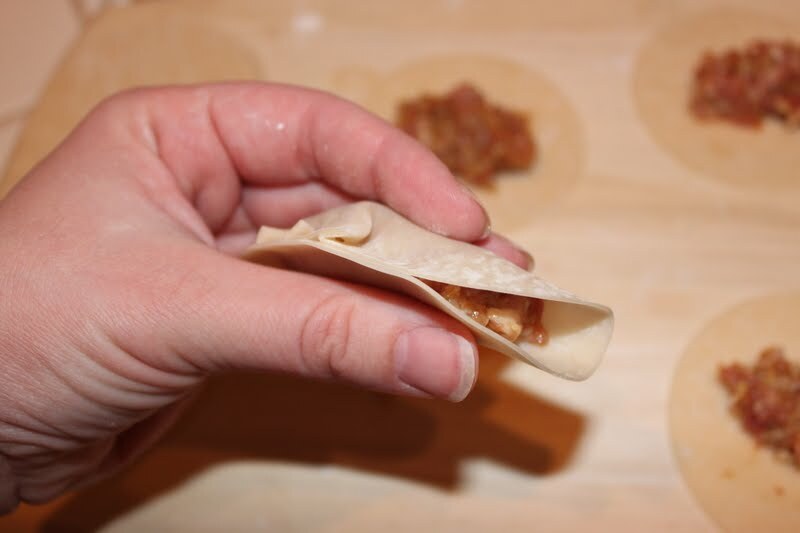 Slide your finger down one side and make a tiny pleat on the front of the wrapper then press that to the back side. Repeat so there are 3 pleats. 9. 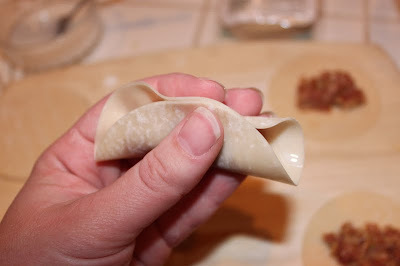 Turn the potsticker around in your hand and make three pleats on the same side as the other pleats. Make sure the entire edge has sealed. Set aside while you continue with all the rest. 10. Heat the vegetable oil to hot in a large flat bottomed frying pan. 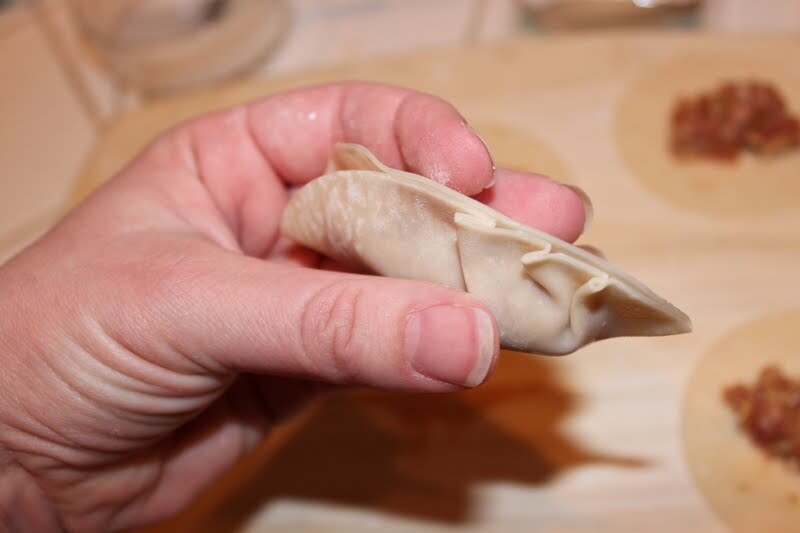 Add the potstickers, seams up. Fry about 4 minutes, or until the bottoms are browned to your liking. 11. Add the chicken stock to the hot pan. Immediately cover with the lid and let the potstickers steam about 4 minutes. 12. Remove the lid and continue cooking so all the stock evaporates and the bottoms get re-cooked. Since the addition of stock makes them sort of wet and soggy, you cook them extra to dry them and firm up the wrapper texture. 13. Serve with dipping sauce, like Dynasty's Potsticker dipping sauce , regular soy sauce, or my favorite plum sauce mixed with little hoisin sauce .